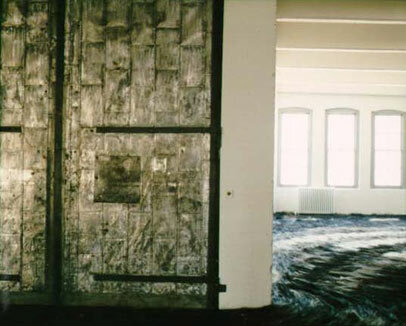 Best known for her site-specific environments that make use of sephisticated technology, unusual and highly sensual materials, recorded sound, and literary and historical allusions, the forty-threeyear-old artist - who received a MacArthur award in 1993 - was selected to represent the United States at this summer's Venice Biennal. LYNNE COOKE: What were your first thoughts when you were offered the American pavilion at the Venice Biennale? ANN HAMILTON: From the very beginning I responded to the fact that this is an American pavilion in another country. So I took my cues from the pavilion's American references and its neoclassical architecture. LC: Was the pavilion built In 1895, the year the Biennale began? AH: No, it was built in 1929, the year the stock market crashed. A rather auspicious date. Its architecture is very Jeffersonian; there are two symmetrical wings that embrace a central courtyard. You're very aware as you step into the interior courtyard that you've crossed a first threshold, and on entering the central rotunda you cross yet another one. LC: The architecture of several of the permanent pavilions in Venice - I'm thinking specifically of the Dutch and Russian pavilions - seems designed to symbolically reinforce the nation's values. Is that true of the American pavilion? AH: Yes. I saw the pavilion for the first time last June, and immediately upon returning to the States I went to see [Thomas Jefferson's Virginia home] Monticello, and I started reading about American history in a way that I hadn't before. I suppose there were some parallels to how I approached my recent installation at the Aldrich Museum of Contemporary Art [in Ridge field, Connecticut]; for that work, whitecloth, I researched New England's Puritan history. For the Biennale the question became: How does an architectural ideal embody a vision of social democracy? And then what are the schisms, paradoxes, and contradictions within that vision? LC: You seem to work simultaneously on two fronts - you think through the ideas in relation to a site on a fairly abstract level, and at the same time you think in response to very specific material conditions. AH: Yes. And I was also thinking about the rhythms of actually being in Venice. The simplest observation I had that was pertinent to the project was that you're always getting on and off boats, so you're constantly accompanied by a subtly shifting horizon. I was thinking about air and movement, of metaphors of descent - that was a very visceral, emotional response. And then, because it's a very particular circumstance to be representing a national identity, I had a more conscious sociopolitical response. I came away thinking about what issues might be most pressing for us now as a country. LC: Where did these thoughts lead? AH: I approached the building as an object, and began working with the relationship between its exterior facade and its interior space. I began with the idea of a mirrored wall that reflected the garden in which the pavilion sits. That went through several permutations before I arrived at what we're building now, which is a large, rippling glass screen that extends across the entire front of the building. It doesn't dematerialize the building but renders it very liquid as an image. LC: And the viewer must decide how to enter the building, around one end of the wall or the other. AH: Yes. And once in the rotunda, you must again decide whether to go left or right. One thing we've done is remove aH of the false ceilings that had been installed in the '60s, which covered the skylights in the four adjacent galleries. For the first time in years there is natural light coming into the space, which is filled not with objects but with something more like a phenomenon. 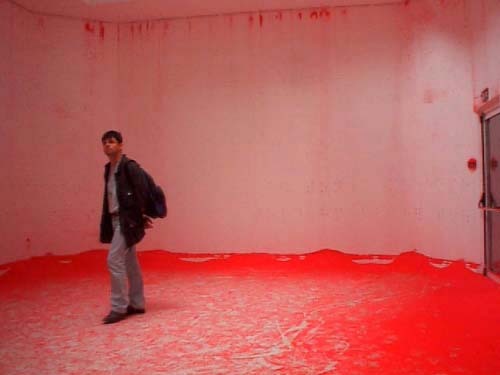 There is a mechanical system that sifts an intense, fuchsia-colored powder slowly down the walls. The powder is very responsive to your movements - to the turbulence in the air you create but are not aware of. It's almost invisible as it descends over the walls, which have been encrusted with small raised bumps that spell out a text in braille. There's a continual movement, a marking of the text that doesn't actually stay on the walls. LC: What is the source of the text? AH.' It's taken from two volumes of poetry by Charles Reznikoff called Testimony: The United States 1885-1915 Recitative . They're incredibly wrenching accounts of acts of violence based on turn-ofthe-century legal documents. And rendering them in braille in some sense mirrors the way this kind of violence is difficult to absorb into the democratic ideal. LC: You will also have a spoken-word audio recording as part of the Installation. What will be on the tape? AH: I used the middle section of Lincoln's second inaugural address, which was an extremely important speech in its time, quite radical in its brevity. It's an attempt to ask: How do you heal the schism that comes from the inheritance of slavery and that is the basis of much of this country's early history? I translated the text into an international phonetic code and spelled out the paragraph according to that code, and you hear my voice, in unison with itself, whispering it over and over again with urgency. The meaning isn't immediately apparent; it's more about the rhythm of the voices than the voices as conveyors of meaning. The quality is halfway between an echo and a remembrance that can't quite be pieced together. LC: Frequently, your most immediate reference points come from literature. AH: Yes, I'm beginning to do work that is more actively about being a reader. 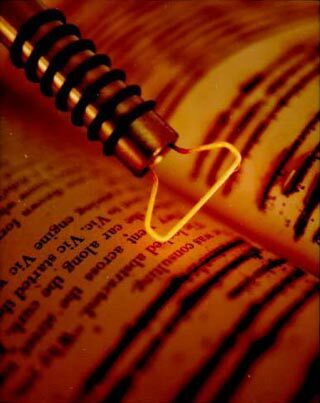 The way one reads is almost like a signature, much in the way one might write or speak. LC: What practical problems did you encounter in working on this project? AH: Well, lately my process has shifted, so that increasingly a lot of what I need is highly skilled technical help. Previously, I produced my installations with the help of volunteers who worked by hand. But now much of my work requires more complicated technology - this piece, myein, is set into the membrane of the building - so we're really pushing the limits of what's possible. LC: What has caused this shift away from the laborIntensive hand-manufacturing? AH: My work shifts in response to my emotional needs from the work, and I'm now looking for different kinds of experiences. But certainly making the braille is very much a hand process. And as we were standing there today putting dots on the wall, I recognized how the underlying concerns of the work are similar to other pieces I've done. No matter how much you think you're making a new work, what rises out of it are continuing concerns. LC: Do these preoccupations - which seem hinged on a dialectic between sensory experience and information acquired through codified forms of knowledge - date back to your formative years in the Midwest? You grew up in Ohio, where you still live. AH: It's hard to know because sometimes you're blind to your own interests. On one level you do this intellectualized research and you think you're really onto something - but it's almost as if you're keeping yourself busy because you're blind to deeper issues. It's like you set up a process that allows these issues to rise to the surface. 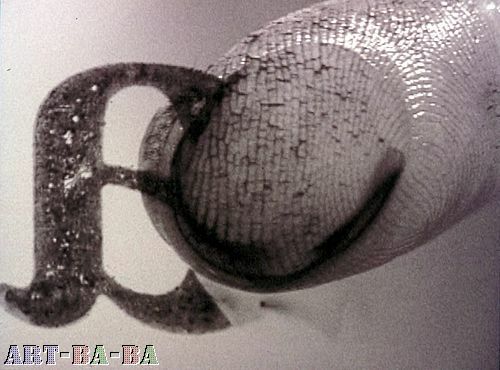 And as my research takes its own path it almost forms an organism within which each project occurs. 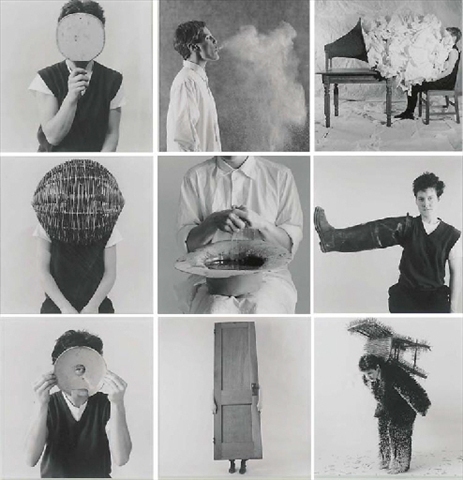 Ohio-born artist Ann Hamilton has been selected to represent the United States at the 48th Venice Biennale, June 12-November 7, 1999. With the assistance of a grant from the Ohio Arts Council's International Program she will create a site-specific installation at the United States Pavilion. Hamilton, one of the most important artists of her generation, is known internationally for an impressive body of work that has included sculpture, photography and video. 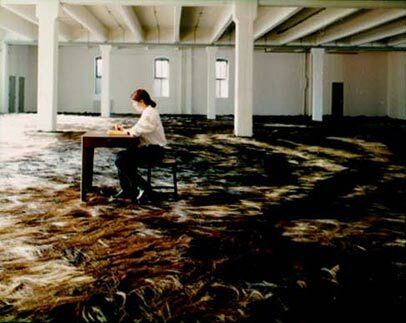 She is best known for complex installations that frequently involve massive amounts of unusual materials including honey, horsehair, birds, books, shirts and soot. Hamilton's installations stem from her deeply personal and visceral response to the specifics of each site. In the case of the U.S. Pavilion, a neo-classical structure designed in 1929, she responded to the plan of the building, with its central courtyard, domed rotunda and symmetrically flanking galleries as emblematic of a human body's two embracing arms. Hamilton also responded to the pavilion's resemblance to Thomas Jefferson's home in Virginia, with its symbolic ties to American social theory and Jefferson's philosophy of democratic social space. The following is an outline of "the picture is still" in Akira Ikeda Gallery / Taura. 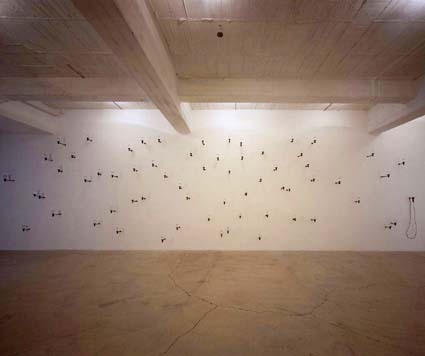 Ann Hamilton's "the picture is still" is held at Akira Ikeda Gallery / Taura, from May 19, 2001 till the end of November. The artist visited Japan in the summer of 2000 to investigate the history and the environment of Taura, Yokosuka City, Kanagawa Prefecture. The gallery space is located next to the harbor and this installation includes the "Dry Ocean" created by more than 130,000 Japanese charcoals(approximately 150,000) hung from the ceiling with threads, the DVD projection and sounds. As requested by the artist, this project was completed with the help of local volunteers. It took 20 days and there were 600 people involved in the making. The size of the space is 15 meters in width, 27 meters in length, 4 meters in height (5 meters in maximum height). Charcoals are suspended through out the space down to 280 cm from the ceiling, that is 150 cm from the floor(approximately 200cm from the lowest floor level). In the center of the gallery, there are two tunnels, which are 12 meters in length and 2 meters in width. DVD projection is installed on both tunnels. This DVD was created for this show. The image is projected directly on the metal door using a projector. A digital camera following a black and white photograph of a child's face creates the image. 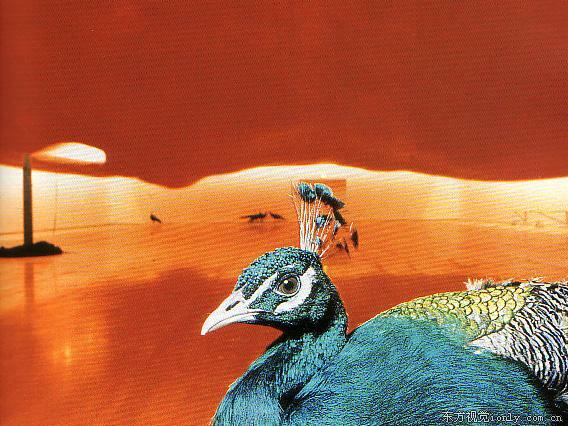 During the filming, the camera was so close to the photo that one would not see the whole picture. The sound from the DVD is the artist whispering and a child's whistling slowed down to create a drone. The natural light that hits the hanging charcoals from one direction and the light and sound from the DVDs create a unique experience. 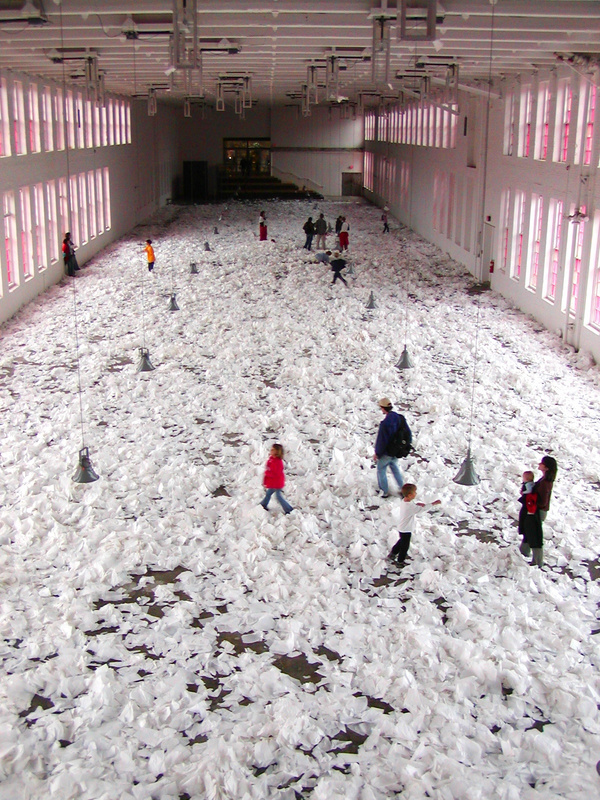 The installations by the American artist Ann Hamilton, as atmospheric as intellectually complex, often are of grandiose dimensions: tons of work clothes, penny coins or printing letters together with people acting or even animals characterize her process-like, site-specific environments. Viewers are incorporated as if in a play, and taught to use their senses anew. 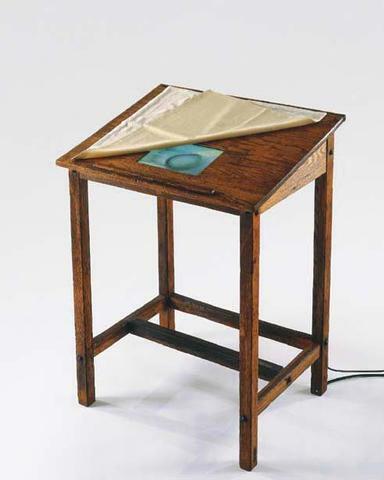 In her most recent work "the picture is still", which is featured in this book, the artist consciously refrained from adding animated elements. In a former torpedo factory at Yokosuka, a symbol-laden place in Japan consecutively used by domestic and American armies for extensive military bases, Ann Hamilton processed enormous amounts of local fuel: charcoal rods made of one-metre-long pieces of branches and tree trunks. 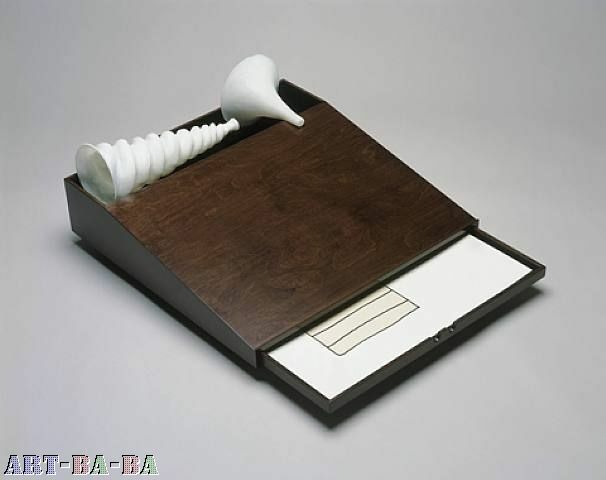 "untitled (body object series) #5-bushhead, 1984/1993"
ART:21: Your work has often been described as 'installation art.' Could you talk about what an installation is and what it means to you, personally, to work in this way? 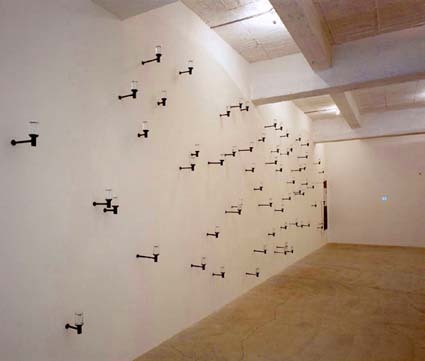 HAMILTON: I think the form, for me, of working in installation is one that always implicates you actively within it. So that unlike an object, which we are very comfortable standing outside of and looking at, to work in installation is to work in relation to a particular place and all of the confluences and complexities of whatever it is that creates that (space). And so, as a viewer, to come in, it's the experience the minute you cross the threshold: it's the smells, it's the sounds, it's the temperature, it's how all of those things have everything to do with the felt quality of ultimately what the thing becomes. I started in weaving, in textiles. I think that my first hand is still a textile hand in some ways, but I was very dissatisfied with the flatness that things actually had when they were done. It seemed like they were dead in some ways. And working, for me, in the form of installation in the way that I have, it's that you're coming in and you're in some instances animating the space, and the process is often very social; for me, that part of it is very satisfying. There's a way that it (the installation) has an ongoing life as it meets the public. Every moment that it's up it's different. It's different from moment to moment, and somehow it's that live time that's just a factor of the form really, or something that is characteristic or inherent in the form is something that makes it continually interesting for me. It's like there's no real repetition in that time. Every day you'll come in and every day it may be the same, seemingly, but within that there's a difference and it's only...I don't know, I guess it allows that to be experienced and to be felt and registered. ART:21: And there's also the way in which installations are impermanent, being specific to a particular place and time. HAMILTON: Well, certainly. It's almost like the attitude about this space is not necessarily to alter it or deny it or erase it in any way, but to make present something that's always here, make it more experienceable, perhaps. And part of that is its live time, and so the duration of that time means that it's ephemeral in this form here. I don't think it means that it can't be reinstalled or have another iteration, but that will always be different. The experience of it will be different because of all the factors that actually give this the atmosphere that it has; it won't be there in another situation or context. I suppose it is that live quality that is the thing that keeps it animate for me. You know, it's that it's never quite fixed, and so I don't really think that it's ultimately ephemeral. I mean, I feel like the video could be installed in a lot of different ways, and could take on different layers of meaning depending on whatever context it goes into. But it will only be like this once. ART:21: That idea ties into the way in which, when you began work on this particular installation, you had originally thought of it being housed in two symmetrical rooms in the Bayly Museum. HAMILTON: Yes, in some ways I took the model of the two rooms that were at the Bayly, and it was partly that I was thinking that I wanted to have one room be the room of the writer and one room be the room of the reader. And I may still pursue this, either here or somewhere else, a relationship between two ventriloquists - that there's a ventriloquist in one room throwing their voice and they are the writer or the reader, and then a ventriloquist in the other. It's because in my own process, increasingly, I feel like my process is one of reading, which leaves no material trace. And so what does it mean if increasingly as a maker I'm actually engaged as a reader, which is sort of the larger question behind the work? So when I decided not to use those two rooms and came here, the two rooms stayed with me, and now they become ghostlike, suspensions of silk organza that sit side by side so they're identical in form. ART:21: Do your works embody something you want to communicate to others? HAMILTON: I think they do. I don't think that they have a narrative. I'm very interested in my own process of research, recognizing all of the layers of meaning that a very simple gesture can have, without feeling like I need to put closure around it being any one of those. In the little thing that I wrote, trying to describe the piece in advance of it actually existing, I talked about a line, that it's a divide. ART:21: Could you talk more about your interest in the line as a divide, as something that divides? HAMILTON: Do you want me to give you a little more background about the line? I think one of the things is that in my own work, the material aspect of it has always been the hand-making that's transparently laid itself out on to the membrane or surface of the architecture in some way, and that's been this evidence of making. And now, in this, it's actually not leaving a real material trace but an image, so the act is now image rather than material trace and there's as much a laying out as there is an erasure at the same moment. I'm interested in the paradox of those, within that relationship, so when I was sitting down to try to describe what I thought this might become, I wrote: "To delineate, to de-line line within the lineate, the inscription of a line. Wound round an enclosure." And that's also what you hear in the audio tape, because you hear the voice (saying) "winding round with the hand, and the hand's enclosure. It announces, fixes, establishes, marks, a visible trace. It is a word, a name, a signature, roving the border between a hiss, sounding the silence of a dividing from, a dividing by, erasures, history." I don't think I can say more than that. ART:21: What would you like for people to take away from this piece? What sort of experience or meaning? HAMILTON: I think that I'm always reticent to contain that too much. It's like the act of naming. It's like you want to leave the act of naming of the work and within the work open as long as possible, to let the experiences fill it out before it gets contained. So, I think the first thing is that you hope is that people come in and that they allow themselves not to name it too quickly, but to actually just feel the presence of it and spend time, to sink into the time of it. But I think that ultimately, out of that, all of the implications of what a line is and what it does or doesn't do are then the things that you take away with you. And I think behind that, if you step sort of further out, it's about how we take in, or take responsibility, or step into our own agency in terms of how we make our presence in the world. And this extension of one's hand outward to touch or to mark is the first offer and reciprocal gesture that we make. And it's the one that is still our primary agency, even if we live within all sorts of technologies that allow the extension out of that into radio and Internet and whatever is now perhaps more invisible to us. It's ultimately, I think, about how we step into our own agency. ART:21: What is the title of this work here in Charlottesville? Pinhole Photos: "face to face"
ART:21: We were talking earlier about the possible connections between growing up and living here in the Midwest, in Ohio, and an aspect of your work that deals with being simultaneously at the perimeter of something and at the middle of what's going on. Could you talk a little more about this? HAMILTON: I think a lot of the very abstract quality of my work - and the literal quality of it - is always dealing with a state or a place or an edge, a border, a threshold, a place that's in between. And I think that's the place that I occupy within my work and that perhaps the work occupies. And so it's interesting to me to think about needing to work at that edge, but then actually living physically in the middle. I had never really even thought about it that way. It's just like if you think about the hair in the project at the Dia Center or the way the pink powder sort of leeched and sought the perimeter in Venice. Any number of pieces - it's always the skin of the architecture, or the material is always seeking the border, remarking upon the border. And that's not just a physical one; it's also the way that we think about things, how we establish the habits of categories and you know all that, those classical categories we inherit out of anthropology: the raw and the cooked, the container and the contained, what is inside and what's outside. You know, we as bodies inherit ourselves as both containers and as being contained. And the paradoxical structure of my work is often to engage that place of in-betweenness; to engage it, not to make a picture of it, not to make it its subject, but actually to try to work at that place in a way that demonstrates it, that's demonstrative, that occupies it. You know it's very abstract, but concrete. ART:21: Could you talk about the notion of the perimeter and the center in relation to the work you've been doing with pinhole cameras? HAMILTON: Well, there are a couple of threads of work that come together in the pinhole. One of them (is that) I can look at where my work took the shift from being a total surround, so that when you walked in you're physically immersed in whatever the material piece is. And I think it's actually this other stuff - the mouth as being the room. And I first started doing it when I was actually taking self-portraits. I was wanting to capture that moment of, I guess, unselfconsciousness, when you're so absorbed or immersed in an activity, whether it's reading making something that might have some rhythms, so that it becomes an immersive experience. And what do we look like when we're not concerned with actually how we look or what we project? And so I started thinking about when you're really immersed in what you're doing, often your mouth falls open, and you know you're never supposed to have your mouth open in public. Like you don't see people standing around, you know...(LAUGHS). It's a vulnerable position; it's a place where you've relaxed and you've let yourself be open and vulnerable in a way. And so I started thinking, "Well, I want to take my own picture in that situation." 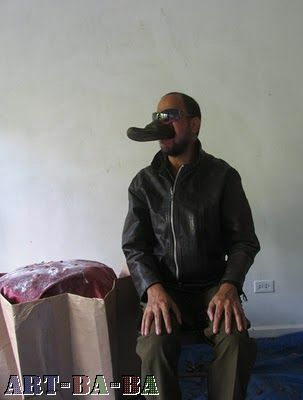 So I devised, over a number of years (it was sort of something that was in the background for a long time) a way of making pinhole cameras, which is very simple, but to make my mouth the aperture. I don't go into the darkroom and load the film in my mouth and then come out and do it, so it is actually still an object that's inserted into my mouth - but to have the orifice of the place where speech exits the body actually become the eye, and to just play with that. Then it was in the process of actually taking those pictures, seeing what they looked like, seeing in fact how the shape of the mouth is very much the same shape as the eye, and seeing myself become almost like the pupil within. The image of my head becomes almost like the pupil in the middle of the mouth, which is eye-shaped. Then, through another set of "what if" questions, I started thinking that it would be very interesting to turn and not face oneself, but to face another person. And so, with Chris here in the office, and Brenda, we started trying it, and in the act of actually doing it, it became very interesting to register this time of standing quite still, face to face with another person, and to make oneself vulnerable, in fact, to another person. In some ways, I think of my earliest work, the very first piece I did when I was in graduate school: I had taken a generic, gray man's suit and covered it in toothpicks, so that the whole hide, the whole skin of cloth, became like a hide. It looked like a porcupine. And then I stood very still wearing this, which was how it came to be presented. It wasn't until I was actually standing there in a social situation where I was on display as an object, that I realized how interested I was in that live time of standing very quietly, and that, in some ways, you put yourself on display. And maybe it's a way of making yourself vulnerable, but there's another kind of strength that comes forward in allowing yourself to occupy that position. So that was the last piece that I did where I actually stood and faced the audience. And now, what is it, fifteen years later, after doing a lot of works in which there's been a performative element or I've been live as part of the projects, but always, in a way, you came from the back to join the activity of the person, or you entered from the side. I'm now turning in the work and standing face to face, as I did in that first project, which is an interesting thing to me, to then wonder where that will go. I think the other thing about it is that I'm in the middle of, or the beginning of, working on this project with Meredith Monk, and I have long loved her work. And I think there's an aspect of my work which is wanting to give voice. So how do I literally make the place where song, as well as all other words, exit the body become my voice by becoming my eye? So to sometimes invert the location of one sense to another part of the body, those kind of dislocations or slippages is one way then we come to see something differently. That's been a way that my work has actually grown and moved at different times. ART:21: How do you feel experiencing the other person in this way - taking their portrait with your mouth? HAMILTON: Well it's very interesting. I think it's not so different than other experiences when I work with a lot of people, or working with a crew. You know when you're making anything, even if you don't sit and get someone's sort of autobiographical story, very early, very quickly, when you work side by side with someone, you have a sense of their presence and their weight in the world. And a sensibility that is not something that you can sort of name, but is the quality of someone, how they occupy space. And...you know, we have all sorts of words, we say, "Oh, they have a such-and-such presence, or such-and-such presence." "It's called 'ghost: a border act.' One of the things that's really interesting...apparently one of the main productions was of the silk that's produced for coffin linings. So I didn't know that, and I thought it was very interesting then, once I made the title, you know, how things that you pick up when you're actually in a space end up being part of it." "I think a lot of the very abstract quality of my work梐nd the literal quality of it梚s always dealing with a state or a place or an edge, a border, a threshold, a place that's in between. And I think that's the place that I occupy within my work and that perhaps the work occupies. And so it's interesting to me to think about needing to work at that edge, but then actually living physically in the middle." "Any number of pieces梚t's always the skin of the architecture, or the material is always seeking the border, remarking upon the border. And that's not just a physical one; it's also the way that we think about things...those classical categories we inherit out of anthropology: the raw and the cooked, the container and the contained, what is inside and what's outside." Although Hamilton worked in the United States and in Europe, her work was at its peak international spotlight when whe was chosen to represent the United States in the 48th Venice Biennele, a prestigious international art exhibition in Venice Italy. The name of the installation was "myein," the Greek word for mystery. Hamilton was given a pavilion, and constructed a 90 by 18 foot wall of steal on the exterior of the building. Along side this wall, she put up panes of textured glass of the same dimensions, so that when looking from the outside in, the pavilion appeared to be slightly dimented, but when looking from the inside out, there was nothing much to be seen. The pavilion was depicting America. The walls inside the pavilion were lined with Braille wthich translated Charles Reznikoff's peom, "Testimony." This poem revealed the sufferings in America of lower economic and social classes. A powder substance dyed a fuschia color was sifted through the walls each day in the amount of 10,000 pounds. As the viewers walked through this controversial and downright messy installation, they heard the voice of Hamilton slowly whispering the Second Inaugural Address of Abraham Lincoln. 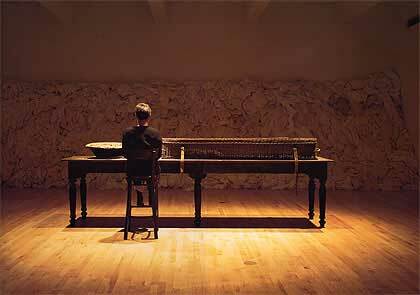 corpus is a new work commissioned from one of the world’s great installation artists for MASS MoCA’s most dramatic space – the massive Building 5 gallery. 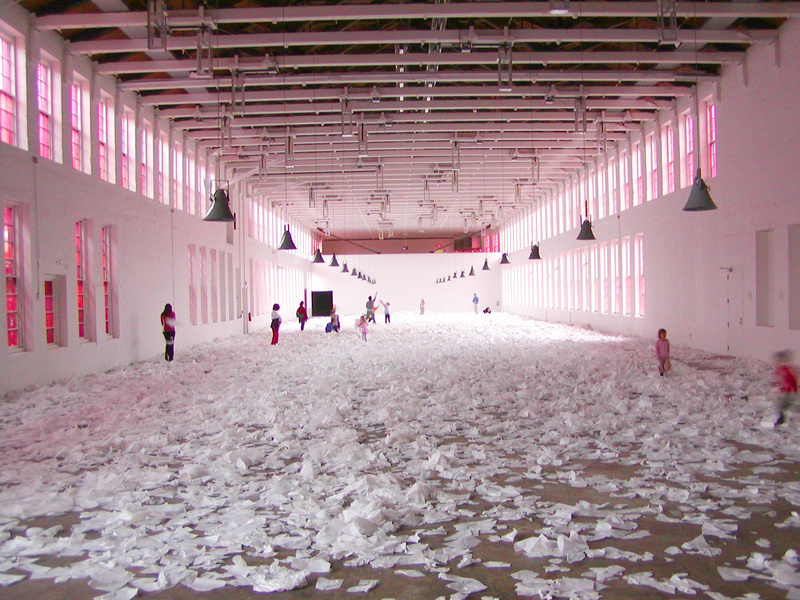 Rather than fill the football field-sized space with objects—as Robert Rauschenberg, Tim Hawkinson, and Robert Wilson did in previous installations—Hamilton has animated the volume of the space with sound, light, and millions of sheets of paper that will fall from the ceiling over the course of the ten-month installation. The consistant themes in Hamilton's work include those addressing social and economic issues of the past and/or the present and pre-technological and industrial communal labor. Her installations work to bring back history that may have been forgotten by a community, a society or a nation. 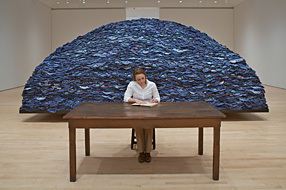 For example, in her installation 1991 "indigo blue" (above), Hamilton displays 48,000 blue work outfits stacked neatly in the shape of a mountain. In this installation, the actor is wringing her hands in a hat filled with honey and water. 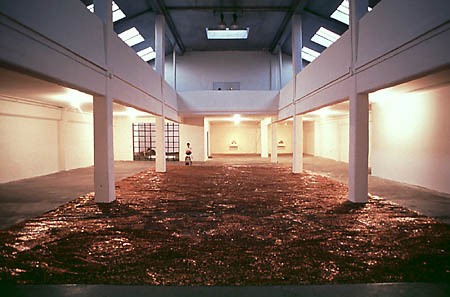 The floor is covered with 750,000 pennies and beeswax, arranged to look like fishtales. 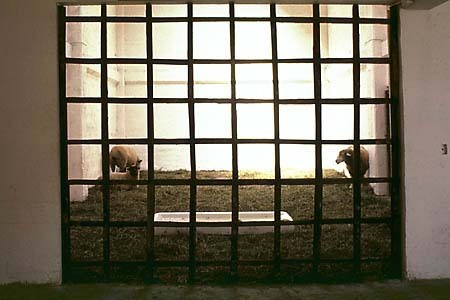 Several sheep are caged in a nearby room. A penny represents something of little value, almost a burden to have. The sheep represent commidities, or things that are made to sell, production for consumption. 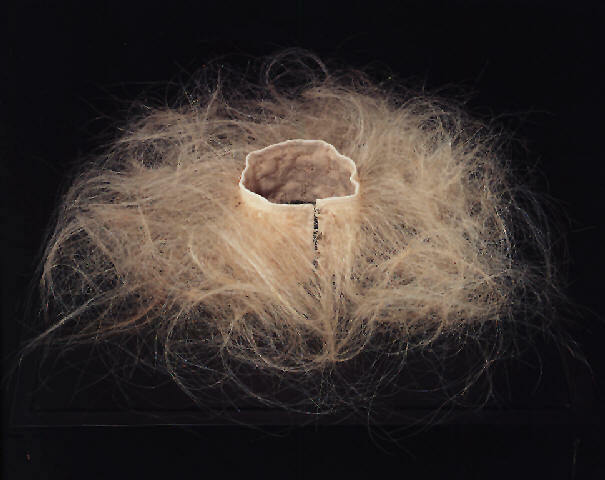 Ann Hamilton fills the basket casket with dough imprinted with the inside of her mouth. If words looked like objects what would they look like? Since the end of May, a group of graduates from Washington University’s Sam Fox School have been crafting oodles of paper hands to be in stylus. Lindsay Deifik, an organizer for this venture, answered some questions about the process and e-mailed me some photos from the studio. What is your role for the installation of Ann Hamilton’s stylus? I am the Studio Assistant Coordinator for the paper hand production here at Washington University. My responsibilities include overseeing the working schedules of our assistants, cataloguing the hands, directing various aspects of our production and of course making plenty of hands myself. I’m really grateful to have fallen into a job that requires me to be making and producing right after graduating with a BFA. I am also serving as a nexus of communication between Ann, her studio in Ohio, the Pulitzer and our base here at the university. It’s been really exciting to see all of the components and dispersed activity that goes into the production of a show of this magnitude here in Saint Louis. When did you start working on the project? Our team got to work on May 24th, the week following graduation. All of us have just graduated from either the Undergraduate or Masters programs at Washington University. We have been applying the intense momentum of studio life towards this project, and, three weeks in, we have over 225 pairs of hands. What exactly goes into the process of making the hands? The process turned out to be more complex than we had anticipated. 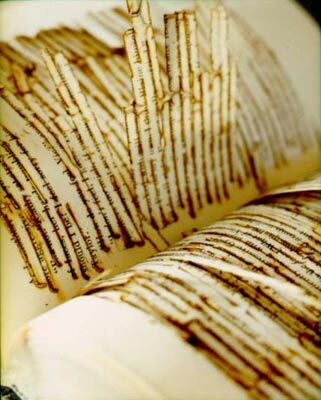 Not only are we forming the hands, but we have also been making much of the paper we have been using. I have experience with making western-style, cotton based paper from my undergrad, but this project has allowed all of us to learn how to make a type of abaca fiber paper. This is much thinner and more translucent than traditional paper. After the pulp is made, it is poured onto a screen in a water bath. Sheets are then pulled and allowed to dry in the sun. It’s pretty magical to see the corners of the finished paper, pulling off the screens in the wind. We are using two methods to then form the hands. Volunteers sculpted many clay hands when Ann was here in the spring. Paper is then applied to the hands, allowed to dry and then cut off of these forms. We also have plaster molds of these forms, where we press paper into them and then pull them out once they have dried. Both of these methods require us to then mend the hands, a stage in the process where much of their individual characters arise. Did Ann give you specific guidelines on how the hands should look? Ann met with some of our team before we began, and gave us some parameters. Our continuing communications and the photographs we have been sending back and forth have contributed to changes in our approach. Ann has been very adamant about each hand having it’s own unique character, allowing the material to dictate the end result.